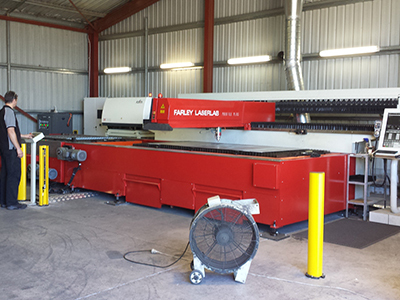 Farley's ELF 2 XPR Plasma Machine has been engineered to give you all the best quality Hypertherm Components to combine to give you the most affordable High Definition Plasma Cutting Machine on the Australian Market Today. Meaning you get the best quality Hypertherm Cut including the Hypertherm Patented "True Hole Technology" all at the best prices. So now for under $150,000 + GST you will be able to achieve the best quality plasma cutting on the market to be compete against others who have spent $300,000 +. Coming with the patented Hypertherm HD SureCut Technology. LONGER LASTING CONSUMABLES - With the Hypertherm Controller and Height Sensor it automatically changes the height of your torch to suite the amount of use of your plasma consumables which means you do not need to change them straight away. Unlike other systems which you will have to fiddle around with the controller to get the optimum torch height levels if it has the option at all. So that means you will be saving a lot of money on your plasma consumables! EASIER TO USE - With the Edge Pro Ti Controller it makes plasma cutting easier than ever before with a large touch screen that directs you through a step by step cutting process utilizing Hypertherm's expert database of parameters which has been tested through 1000's of machines across the world. Take advantage of the easy to use controller and cutting system and save on time, money and troubles. QUALTIY CUTTING - Using Farley's ELF 2 plasma machine it gives you a superior cut, through its quality engineered and built motion system that meets and exceeds Hypertherm standard of cutting. This will prevent any extra work such as dross removal and cleaning from materials that have simple designs. When quoting the same plasma torch the motion system provides a significant difference in the quality of cutting, so don't just look at the plasma torch, look at the machine as well and get some samples cut and you will see the difference. HEAVY DUTY DESIGN - Farley's ELF 2 Plasma cutting machine is designed and built to hold and cut up to 60mm+ materials which gives you the reassurance that you can cut thick material like any quality job shop should provide. Make sure you check out the quality of the table as you might buy a Quality plasma but later realise you can not cut thick materials as the table will not hold it properly or cause heat distortion which will further ruin your motion system. FULLY SUPPORTED - Farley LaserLab has an Australian team of engineers and technicians to deal with any questions that you may face with your machine with full warranties to give you the peace of mind that you are getting a quality machine with quality support. Not only do you have the Farley Team, you can utilize Hypertherm's support network with cutting parameters and technical questions to support their controller, height sensor,software and plasma source. This means you get two large companies that will always be around to support your machine. TRUE HOLE CAPABLE - With upgrades to the ELF 2 High Definition plasma cutting machine you get all the benefits of Hypertherm's True Hole Cutting that will give you that extra edge in quality cutting which will help you win those extra jobs.